You can’t take it with you … or can you? 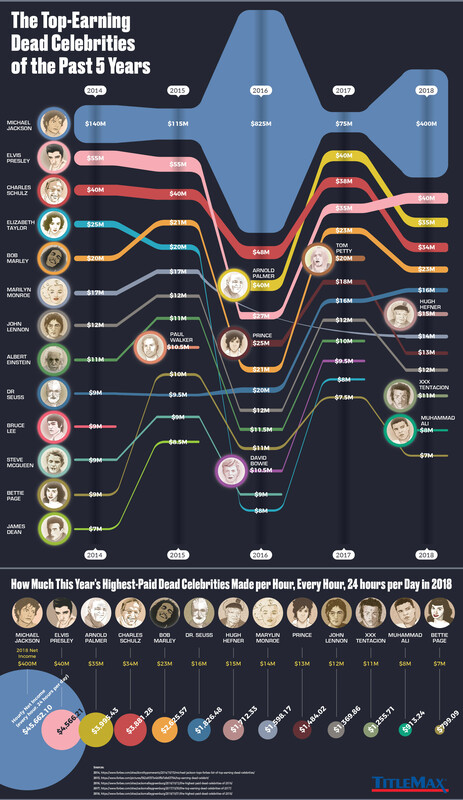 These are the highest-paid dead celebrities, who make more money posthumously than most of us will in our lifetimes. Usually routed to their estate, record label, or an organization set up in their name, the money of these top-grossing dead celebrities is still getting pumped into the economy, albeit more slowly. Some of these musicians, artists, and figures have been dead for decades, and some of them didn’t see a fraction of the cash they’re earning now when they were alive. Should people be allowed to earn this much after they’ve died? Who Is the Richest Dead Person? Of the highest-grossing dead celebrities of 2018, Michael Jackson beat them all by a great deal. Jackson had $400 million in earnings in 2018 alone, making him the highest-earning dead celebrity. Who Else Is On the List of Top-Earning Dead Celebrities? While this list has shifted and changed over the years as estates produce new merchandise and allow major companies to use the artists’ images or works, the major players have remained fairly consistent over the past five years. How Much Did Michael Jackson Make Last Year? In 2018, Michael Jackson earned $400 million, which is ten times more than the next on the list — Elvis, who only made $40 million. About $287 million of that came from the sale of a stake in EMI Music Publishing. If you were to calculate that as an hourly wage, Michael Jackson’s 2018 income would’ve been $45,662.10 per hour. But that’s nothing compared to only a few years ago. In 2016, Jackson’s estate sold a huge stake in Sony/ATV, which owns songs by Bob Dylan and the Beatles. The estate’s earnings for that year were about $825 million, nearly a billion dollars. How Do These Celebrities Make So Much Money Posthumously? Among the highest-grossing dead musicians are Elvis Presley, Bob Marley, Prince, John Lennon, and David Bowie, all of whom have sold a great deal of albums years and sometimes even decades after their respective deaths. Typically, though, it’s merchandising, such as Bob Marley cannabis and smoking accessories, and licensing that rakes in the big bucks. Authors and artists like Charles Schulz and Dr. Seuss still sell comics and books but have also made a ton of money from film deals, advertising, and, again, merchandising. Often, this ridiculous amount of wealth goes to the person’s family and friends. These exorbitant sums and the fact that the people receiving them haven’t really done any work to earn them is why some believe the federal estate tax should be raised a great deal. For now, though, what happens to the money rather depends on the person receiving it. In the case of John Lennon’s wealth, Yoko Ono, his wife, has donated millions to charity, including building more than 90 schools. In Michael Jackson’s case, his children, Paris, Prince, and Blanket, have been struggling to lead normal lives after they initially were saddled with a huge amount of their father’s debt. While the cash gives family the freedom to pay off debts and donate to charities, these exorbitant post-death sums may be worth taking a closer look at.